Last week, I went on my first real road trip, and I wish I had brought this book with me. I read it years ago, maybe even before I could drive, and loved it. Steinbeck’s trip was very different from mine. 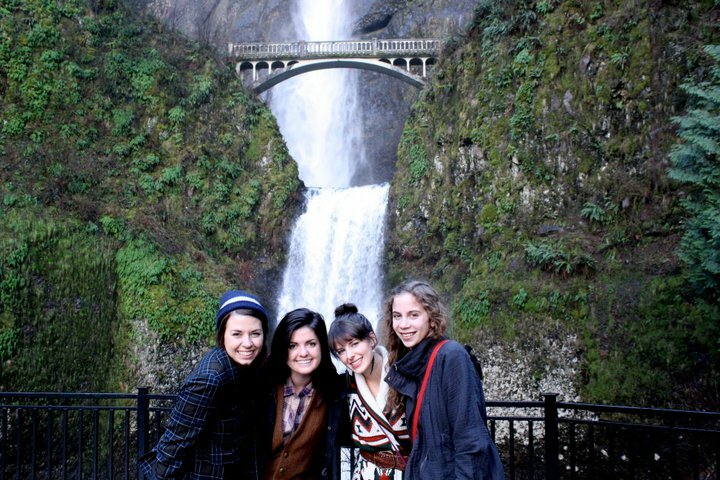 For starters, his only company was a poodle, and I got to travel with three wonderful girls. 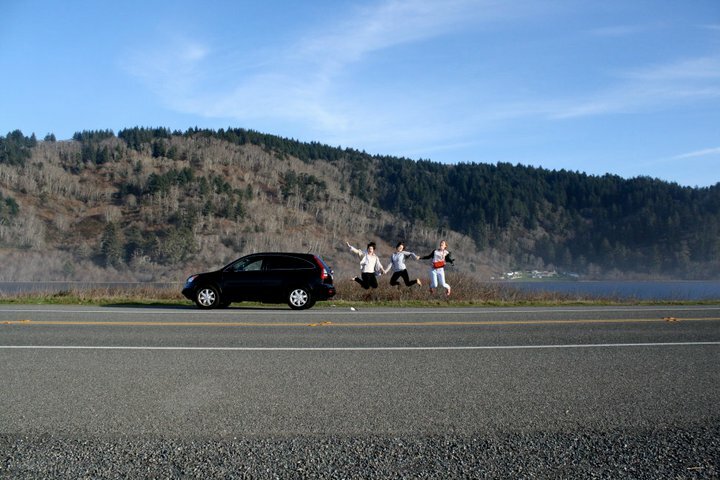 His trip was almost 10,000 miles; ours was 2612.1 miles (the distance from Los Angeles to Portland, Oregon and back). Over the course of our trip, Julia, Chelsea, Tracy and I held a two-week-old baby, witnessed a Dungeons & Dragons game, explored an abandoned theme park, ate bacon doughnuts, and, like Steinbeck, had our fair share of bite-sized interactions with strangers. I have noticed in me a temptation to collect people like I collect experiences. On our road trip, I don’t think we came across anyone even close to “a nothing,” but I sometimes had the urge to instantly understand and even categorize those we met. I’m not quite sure how to combat this, but I know it involves humility. There should be a sort of wonder in meeting a new person, probably not unlike the wonder of exploring a new place. But over the trip, sometimes I forgot that most people we encountered (waitresses, shop owners, homeless people, relatives, friends) have lived longer than I have, and all of them have a story just as meaningful as my own. There is not time to hear everything (or anywhere close to everything) someone has to say, so sometimes to remember that each person I meet is a complex, mysterious being, and that my perception of them is embarrassingly incomplete, is enough. I am arrogant when I assume I know how the drug addict sprawled out on the streets of San Francisco got where he is, or why the waitress was so rude to us; there is so much I don’t know even about the girls I travelled with. In fact, one of the richest parts of the trip was learning bits and pieces of why my friends are the way they are. 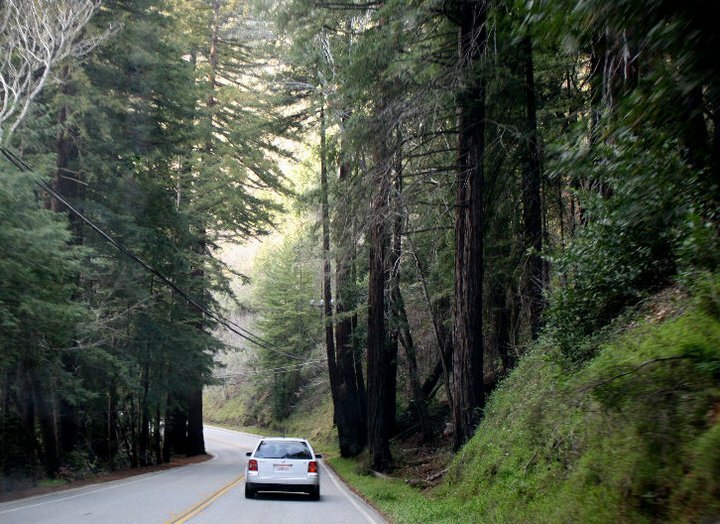 That, and pulling over every few hours to smell the salt-soaked coast or stand next to a redwood. I have been reading the Psalms these past few days for the Great Books program I am in; for our first session we will be discussing 44 of them, categorized thematically. After an entire semester of Medieval Theologians from Pseudo-Dionysius to Thomas Aquinas, the poetry of the Psalms is a much-needed reminder that God appreciates beautiful sentences (though imagine how much more beautiful they are the original Hebrew!). The last group of Psalms I am reading is “Psalms on Creation” (8, 24, 33, 65, 104, 136). I was expecting, from the categorization, to read about “nature”—trees, sunlight, squirrels. After all, when someone talks about enjoying or caring for “creation,” he usually means the forests, the environment, the earth. But I found that I was also reading a lot about myself. In Psalm 65, God doesn’t just “still the roaring of the sea,” He also stills “the turmoil of the nations”—and in the same sentence. Now, I know the appropriate reaction to this is supposed to be something like “can you believe that the same God who created the universe also hears our prayers?” And in my better moments, I am overwhelmed by that truth. But yesterday, I found myself resisting this lumping: I’m not sure if I like the direct comparison of the waves of the ocean to the wars of men. * this particular section within Franny and Zooey is saying much more than I can understand… I just read it yesterday and have only picked a very tiny part out to reference, but I want to write again when I have thought about it more. It is a brilliant book. When I came across this paragraph yesterday, my immediate (admittedly panicked) thought was, “I am training to be a watch-dog of society? !” The task seems just a little bit daunting. And then I started to wonder how many novelists would consider themselves “watch-dogs of society.” A few came to mind (I think Salinger is one of my favorites), but very few of them were current, and none of them popular. But Steinbeck is explaining the role of a “good” writer, and of course, “popular” and “good” are two different things…but were they always? When A Russian Journal was published in 1948, the New York Times Bestseller List was shorter than today, but it was comprised of arguably much better books. Pulitzer Prize winner Norman Mailer‘s novel about the Philippines Campaign of World War II, The Naked and the Dead, made the list, as did Irwin Shaw’s The Young Lion, about Shaw’s experience as a warrant officer. Thorton Wilder’s The Ides of March, about the death of Julius Caesar, appeared, and he went on to win a Pulitzer Prize too. Fair enough. The purpose of this post isn’t to criticize thriller fans. It’s rather to ask whether the American writer’s job description has changed. What would Steinbeck say to Patterson’s calling himself a “storyteller”? Perhaps being a storyteller and a writer are two different things? Because it just doesn’t quite seem fair for Patterson to shrug off “prose styling” and still call himself a writer. And is American society still “not very fond” of writers? At the very least, it seems we have grown increasingly fond of storytellers. Maybe the “watch-dog” title has been stealthily taken over by television hosts and bloggers. And that might be alright, just as long as someone is barking at the burglars. Of course, I do not mean to say there are no current American writers who consider it their foremost duty to satirize society’s silliness…I am not nearly well-read enough to make such a claim. Surely there is still a place for the writer—Steinbeck’s “good” writer, that is—today. I don’t think I want to be just a storyteller when I grow up. I’m not positive I want to be a watch-dog either. One thing I do know: I do not want to write of my glands. Yesterday in a used bookstore, I came across a ratty copy of a John Steinbeck book I had never heard of before called A Russian Journal. Since the other book I was looking for was nowhere to be found, I took a chance on this one instead. It was worth the $.48 I paid. A Russian Journal is Steinbeck’s account of a 1948 trip he took with photographer Robert Capa to the Soviet Union. Neither wanted to concern themselves with politics, but rather, they aimed to “set down what we saw and heard without editorial comment, without drawing conclusions about things we didn’t know sufficiently”—a refreshingly unique endeavor, given this is was beginning of the Cold War Era. I was surprised to find Steinbeck himself just as intriguing as his subjects. When one is recording a cross-cultural trip, it is difficult to mask personal quirks entirely, and Steinbeck isn’t shy. While he is cautious about casting judgment on the Russian civilians, he is not afraid to spend a few paragraphs explaining just how much of a “bathroom hog” his travel companion is (according to Steinbeck, Capa spent hours in the bathtub each morning reading the newspaper). Over a period of about six weeks, Steinbeck and Capa toured Moscow, Kiev and Georgia. While Steinbeck recorded everything from their transportation difficulties to their interactions with writers, farmers, and soldiers, Capa took thousands of pictures (some of which ended up confiscated). I was especially intrigued by their descriptions of rural Ukraine; I had the chance to teach at an English camp near L’Viv this past summer, and was delighted to learn that Steinbeck and I share a few common experiences. 60 years after he wrote A Russian Journal, Ukrainians still hold firmly to the belief that open windows cause sickness; this makes for some very uncomfortable bus rides. Probably the hardest thing for a woman too. This next semester I am taking a class that focuses on collaboration between writing and art majors, and it’s likely I will be working with a photographer at some point. I am beginning to realize in myself a vague grudge against pure objectivity, and I hope for the chance to confront it in the coming months. One night this Christmas break, I watched the documentary Exit Through the Gift Shop: A Banksy Film. I was absolutely fascinated, and when I watched it again a week later, it was just as good. The documentary tells the story of Thierry Guetta, a Frenchman obsessed first with video-taping graffiti artists (in the guise of a filmmaker) and then with becoming one himself. In the first half of the film, Guetta shadows two famous street artists: LA-based Shepard Fairey, and Banksy, a notorious British artist whose identity is unknown (his face does not appear in the movie and his voice is distorted). Fairey is best known for his Barack Obama “HOPE” posters, and Banksy for his politically-themed installations illegally placed inside the British Museum, near a ride at Disneyland, and along the Israeli West Bank Barrier (to name just a few). Guetta has very little artistic vision behind his work, and it is clear to everyone watching the documentary that he is simply mimicking what he has seen Fairey and Banksy do (when asked the messages behind certain pieces, his explanations are painfully shallow). But, shockingly, after the first week of his show, Guetta has sold almost a million dollars’ worth of art and his pieces go on to show in galleries around the world. Is Guetta’s work art? If his buyers realized how little of himself he actually put into it, how little he had to say about it, would they still pay tens of thousands of dollars? Or is a work of art’s value found solely in the piece itself, and the artist’s thought process completely irrelevant? In the documentary, both Shephard Fairey and Banksy were surprisingly gracious towards the man who had seemingly cheated his way to the top of the art form which they had each spent years establishing. Though Banksy calls Guetta’s art “meaningless” and says it “looks like everyone else’s,” he also acknowledges that in art, there aren’t supposed to be rules. Though it seems more unlikely that someone could pull of a best-seller by simply mimicking a great novelist, the writing world has encountered a few “fakes” of its own. Take, for example, James’ Frey, author of A Million Little Pieces. Frey first submitted the book as a fiction work, but when publishers refused him, he decided to call it a memoir instead. When journalists began to question the validity of certain parts of the book, like his time at a drug rehabilitation center and the suicide of a girlfriend, Frey admitted that much of his account was exaggerated or untrue. So what about Frey’s book? Does the fact that he made a lot of it up make it worthless? (Admittedly, I didn’t really care for his writing even when I thought it was real, but I was outnumbered. It topped the New York Times Bestseller List for fifteen weeks straight). Dave Pelzer, author of A Child called “It,” is facing similar accusations of fabricating his own memoir. In it, Pelzer claims that his mother viciously abused him as a child, constantly starving him, making him eat his own vomit, and even stabbing him in the chest; Pelzer’s family says he is an attention-starved liar. (And their accusation is made more convincing given that Pelzer’s website says he is a “Pulitzer Prize Nominee,” which is simply untrue. He did, however, submit his memoir to the Pulitzer committee, which anyone with a spare $50 can do). It could be argued that Guetta is better than Frey and Pelzer: they both lied about where their work came from; he never did. On the other hand, Guetta’s work (which was actually done by his crew) simply mimicked other artists; Frey and Pelzer both wrote their books themselves. Surely none of these men are respectable artists, but what does that mean for their work? Earlier I wrote a post about the difficult kind of reader’s empathy, the kind that weighs a reader down and darkens a good mood. But Zetland has the opposite experience: he is overwhelmed, consumed even, by the beauty of Melville’s story. Is it escapism? I have floated before… reading George MacDonald’s Phantastes or G.K Chesterton’s The Man Who Was Thursday… But I didn’t feel like I was escaping into a fantasy world as much as glimpsing into a world that sometimes seemed truer to me than reality. I was not living vicariously through the narrators of these stories merely for the thrill of it: they were teaching me, reminding me. Last year, I attended a lecture on Plato’s Timaeus a few weeks after I had read the work. The Timaeus dialogue was the most difficult work I read all semester, and though I only understood bits and pieces of it, I distinctly remember our lecturer explaining Socrates’ view on poetry. Socrates believed that true poetry* was a shadow of the Form world**, not the world we live in. And since our world is also only a shadow of the Form world, then true poetry is just as true as what we call “reality.” In other words, Narnia is as real a place as Chicago. Zetland’s statements are complex, but it is clear these are the words of a man who has discovered (or perhaps re-discovered) the power of story to nourish, to remind him of the life he had forgotten somewhere along the way to getting his Ph.D. What a beautiful moment. *Socrates’ criteria for “true” poetry is much different from most people’s—he calls Homer and his contemporaries “enemies of the truth,” and thinks their work harmful. **Socrates asserted that our souls resided with the Forms before we were born. There, the most fundamental realities exist; everything we see on Earth merely mimics the Forms. For example, anything we call “beautiful” is really just a reflection, or shadow, of the form of Beauty. A little girl has been benevolently haunting me for a few years now, but I know how to get rid of her: one day, I will write about her. I started to think about her the summer after I graduated high school. I wrote a few paragraphs about her, thinking eventually I could turn them into a short story. The problem is, there is still so much I don’t know about her (including her name). She has only given me fragmented images of herself, and every time I have grown impatient and tried to think up more images myself, they have turned out blatantly contrived and ended up in the trash. I know this sounds silly (Freud would probably have something to say about it), and it’s not usually how I write. I have read interviews with great writers where they talk about their characters taking on a life of their own and beginning to dictate the story. Sometimes I roll my eyes, but usually I am just jealous. These authors make writing a novel sound so easy…mystical even. Only once (described above) have I felt this sort of nudge from a character, this feeling that I am not merely making her up, but telling her story. The only problem is I haven’t gotten very far in the “telling” part. I have tried to go back and write more about her, but I have probably added 3 sentences since she first introduced herself to me 3 years ago. Part of me is afraid of getting her all wrong, of being unable to portray her as she is. I am not just waiting for more glimpses into who she is, but I am also waiting to learn how to write fiction well (I have yet to take a writing class, but am trying to get into one next semester). At least, that’s what I tell myself. I am still reading Virginia Woolf’s essay “A Sketch of the Past,” and last night I came across a passage where Woolf shares how her mother’s death, which occurred when Woolf was a girl, affected her teenage and adult self: “until I was in my forties…the presence of my mother obsessed me. I could hear her voice, see her, imagine what she would do or say and think.” Woolf goes on to explain that it wasn’t until she wrote To the Lighthouse, a book that came to her in “a great, apparently involuntary, rush,” that she stopped being obsessed with her mother. I don’t know the answer to Woolf’s question, and I’m curious to know whether she ever found a sufficient one. Woolf’s situation is obviously different from mine in that she was “laying to rest” her mother, while I am hoping one day to lay to rest an invisible friend of sorts. But Woolf’s thoughts helped me identify one more reason I might be avoiding finally getting this girl down on paper: I’m afraid that once she is gone, no one will replace her, and then I will lose these strange and exciting nudges forever. Since starting this blog, the internet and I have begun to develop a more intimate relationship, and I don’t know if I like it. I have never followed any blogs before (besides the occasional browsing of friends’ pages), but now that I’m writing one, I figured it would be a good idea to familiarize myself with the blogging community. Unfortunately, it has not been a smooth transition. After a few minutes and a few dozen clicks of the mouse, I am completely overwhelmed. Not just because there is so much information, but because the information is so literally up-to-the-minute. Of course, current news reports are necessary and helpful, but even blogs about books are reviewing novels that just came out this past week, or ones that have yet to hit stores. How completely irrelevant my thoughts feel! In June I read an article in Wired Magazine entitled “The Web Shatters Focus, Rewires Brains.” In the piece, Nicholas Carr explains how, based on recent research, the internet has certain negative effects on our brains, including less control over working memory and decreased ability to concentrate on a task. The article was intriguing, a bit frightening (though Carr also included some positive effects), and very over my head, but it made one thing clear: the internet is changing our brains. I also wonder, though, how much the internet—not so much the content, but the medium itself—is changing our expectations and our perspectives. So what is the difference between “reacting” and “thinking deeply”? For one, the latter necessitates time. I have found usually my favorite pieces covering an event are the anniversary pieces: the essays written a year after September 11 are often more powerful and thought-provoking than the ones written one week after. The idea that with time comes perspective isn’t a new one, but I wonder if we are beginning to forget it. If our culture really is making a transition from reading books to reading instant tweets and daily blogs, are we losing more than our ability to concentrate? Are we also in danger of losing our appreciation of deep, thought-provoking writing? I don’t mean to say that every blog is hasty or shallow (in fact, I know plenty that aren’t), but the temptation to simply react is a strong one. And for good reason: there is so little time to wrestle with ideas or reflect on events before the world has moved on. I also don’t think it is harmful to read blogs (that would be just a little bit hypocritical of me, now wouldn’t it)—I just am worried when people begin to substitute their blogroll for their bookshelf. Because books, even non-fiction ones, cannot be rooted solely in reaction even if they wanted to be; TV and the internet would beat them to the punch every time (and even before TV, it was the journalist’s job to react, not the novelist’s). Books take years—to write, to edit, and to publish—so the writer knows his message must transcend 2011. And besides, it’s much less comfortable to fall asleep with a computer on your lap. Last night I leafed through Virginia Woolf’s Moments of Being, a collection of memoir-like essays I had never heard of before last week, when I found it in the fifty-cent section of a used bookstore. I am ashamed to say I have not completed any of Woolf’s novels yet (I must have started To the Lighthouse fifteen times). Her writing is definitely not to blame; it’s more that I have learned I cannot read her books well in half-hour (or even hour-long) increments, so I have given up attempting one during the school year. All this to say, the essays that make up Moments of Being make me all the more excited to read her work. Woolf has a quirky sense of humor that I hadn’t picked up on in her more scholarly essays; she does not seem to take herself seriously—not nearly as seriously as I take her at least—in the two essays I have read so far in this tiny book. And perhaps that is why the pages and pages of her childhood stories are so easy to read. I have always loved reading memoirs, but occasionally I come across one where the author’s tone is just too distracting. Sometimes I find myself snottily thinking, “You’re not that special. Many children have felt that way. Stop thinking you’re special.” And this isn’t usually because of a particular story the author is relating, but because of a self-important tone throughout their stories…The more seriously an author takes himself or herself, the less seriously I am inclined to take them. And sure, writing a memoir is an inherently narcissistic act, but I just love reading them. I think it is a wonderful idea to write about what you know, and, when done well, memoirs can teach so much. But there is a danger to writing one (probably one danger among many): the temptation to reduce the people in your life to characters in your story. And though I am not in the process of writing a memoir, I am no stranger to this embarrassingly egocentric habit. As children we all do this. I read somewhere that the reason the game Peek-a-Boo is so entertaining to a baby is because their world is one governed by a single law: “out of sight, out of mind.” When an infant cannot see your face, you do not exist to them. I am afraid that I sometimes slip back into my infant-worldview. When writing non-fiction, it is impossible to get around reducing people. I remember this frustration when writing about my sister Kate—not only with her “character,” but with all the other “minor characters” in my piece (my other sisters, my parents). My writing instructor reminded me that I can never give anywhere close to a complete picture of another human being. Since the story was about Kate’s obsessiveness, it would have been distracting to try and capture the complexities of everyone else in my family, and he encouraged me to choose one trait of each “minor character” to emphasize.